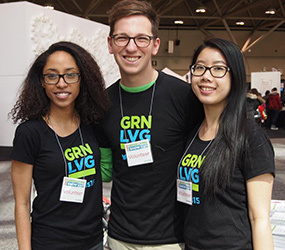 Volunteering at the Green Living Show is a great opportunity to meet new people, have fun and learn about living green! Thank you for applying to volunteer with the 2020 Green Living Show! We will be reaching out close to the end of the year! Please note that by requesting a position, you are not guaranteed to be placed in that position. Green Living needs your help with ushering attendees to their seats before presentations, tidying up the stage area following presentations and assisting our stage Producer. This year we will have multiple stages – Main Stage, Kids Zone and Yoga. THE FUN PART: you may get a peek at one of our green celebrities! Help us keep this food area clean. Tasks include wiping down tables and trays, as well as restocking the compostable cutlery. THE FUN PART: your senses will be delighted as top chefs cook up a storm of local food delights! Attendees to the Show can take fuel-efficient and electric vehicles for a spin. This volunteer position is located outdoors and you will help usher attendees from inside the Show to the cars outside. THE FUN PART: you can check out the latest and greatest in green cars! Here we need your help ensuring that kids aren’t left unattended. This area is meant for both kids and parents to enjoy together. You can also make sure that our presenters have everything they need in order to keep the day’s events flowing. THE FUN PART: you may get to meet some endangered species! I agree to receive information about volunteering at the Show and other green events (in order for Green Living Show to communicate with you, you must check this box). I agree to receive updates about the Show.